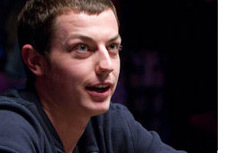 Tom "durrrr" Dwan was the center of attention on Full Tilt Poker in March, raking in about $3.27 million over a total of 64,225 tracked hands. Dwan's active month made for some really entertaining games, despite the fact that "Isildur1" basically disappeared again during the second half of the month. Dwan is now up about $4 million on Full Tilt in 2010, and about $6.5 million since December 1st, 2009. "durrrr" is about $400k away from being break even on Full Tilt Poker since the start of 2009 - quite a feat, considering the fact that he lost nearly $7 million from Jan 01 '09 to Nov 30/09. Dwan benefited from a strong performance over the past week that saw him earn about $1.45 million over 19,596 tracked hands. "durrrr" has been putting in some very long sessions on the site as of late, and this has certainly been paying off for him. "Ziigmund", who engaged in three very entertaining heads up battles against Dwan over the past few weeks, managed to finish March up around $1.82 million. "Ziigmund" is now up around $2 million on the year on FTP. Cole South, who got off to a very hot start to 2010 (he was up $3.5 million at the end of February), cooled off considerably in March, dropping nearly $2.6 million over 25,442 tracked hands. For Gus Hansen, it was also the same story - a hot start to 2010, followed by a large downswing (-$1.6 million) in March. Speaking of downswings, Patrik Antonius managed to lose just over a million dollars in March, bringing his total losses for the year to just over $3 million. Brian Townsend is now down about $2.36 million for the year. Enjoy this high stakes action while you can, as the World Series of Poker is less than two months away. You can expect that the likes of Antonius, Dwan and Ivey will basically be living inside of "Bobby's Room" this summer, just like last year.